This three story creek-side town-home is a perfect place to relax! The entry level offers 2 bedrooms and a full bath. The second level has a recently remodeled kitchen with granite counter-tops and pine cabinets. Also on the second level is the living area with wood burning fireplace (wood not provided), another full bath and the third bedroom. On the top and third level there is a loft. Please be considerate - no smoking, no pets! Amazing place! Feel very homey and clean. Check-in and Check-out process was easy and quick! I loved how the directions were very clear! Definitely would recommend especially for a big family! Comfortable and cozy apartment. 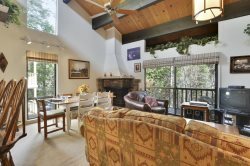 Very spacious, clean, and less than 10 minute drive to several restaurants, hiking trails, and Kings Beach. Great value!